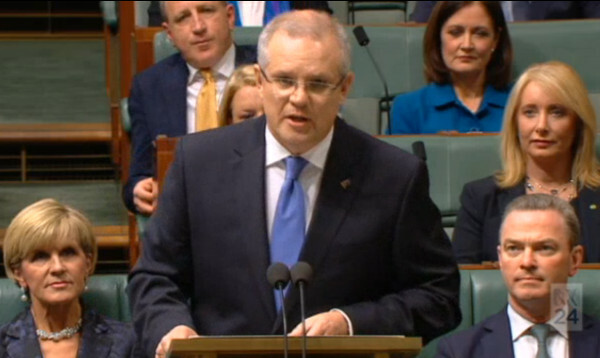 The Federal Treasurer Scott Morrison delivered the Federal budget without once mentioning in his speech (Full text at Sydney Morning Herald) climate change, renewables, phase out of coal or transitioning to clean energy economy. This Government, though it recently signed the Paris Agreement, is in effect in climate denial going into the July 2nd Federal election. The Treasurer's only related reference was to the abolition of the carbon tax. The Abbott/Turnbull government kept the tax scales that Labor introduced as compensation for introduction of carbon pricing. So although high income earners and companies get a tax cut in this budget, everyone on low income has already had our tax reward back in 2012, and hence get nothing. I'll leave others more qualified to comment on the economic and political ramifications of this budget. But the absence of any mention of the environment, of transitioning the economy away from coal to renewables and a clean energy future, and the tens of thousands of new jobs this would create, makes it clear this government is firmly stuck in the past. They use the word innovation a lot (5 times in the Treasurers speech), but it is more marketing than actual substance in supporting and funding the science and education in transforming to a low carbon economy. Labor released it's Climate Action Plan last week (See my report), and the Government immediately started a scare campaign. An opinion poll by Essential Vision published on the day of the budget showed that 57 per cent of Australian voters supported Labor's much higher 45 per cent by 2030 climate targets and introduction of an Emissions Trading Scheme. 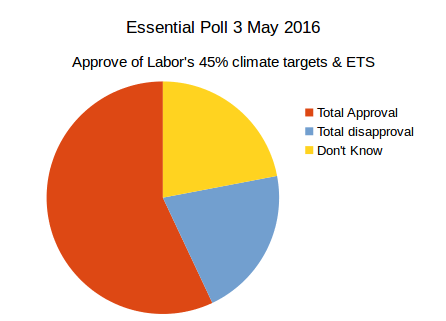 Earlier opinion polling from March demonstrated an increase in climate change awareness and majority support for stronger action on climate change. Friends of the Earth, Australian Conservation Foundation, WWF-Australia, and the Climate Institute released scathing statements in response to the budget. See below for their comments and the reaction to the treasurer's speech on twitter as curated by me.